Italian currency issued during World War II. The Italian lira (₤) was the currency used in Italy and its colonies until the Euro was adopted in 2002. This particular bill was likely used by Sergeant John B. Hancock (1913-1944), an American soldier. Photocopy of original bill: Private Collection of Linda Hughes. 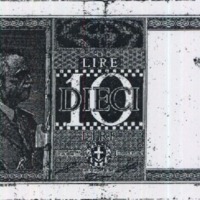 “Italian Currency During World War II.” RICHES of Central Florida accessed April 20, 2019, https://richesmi.cah.ucf.edu/omeka/items/show/9403.